The Joy Formidable On World Cafe : World Cafe This power trio from Northern Wales has taken these shores by storm after the stateside release of its debut LP, The Big Roar. 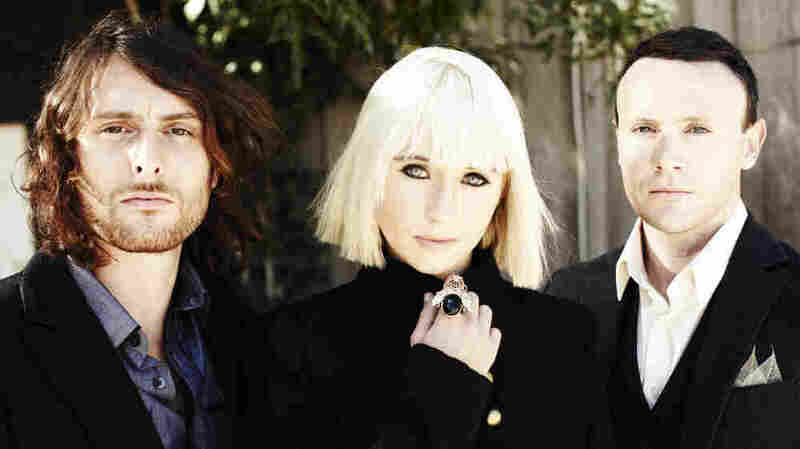 Hear The Joy Formidable speak with host David Dye and perform live. Matt Thomas, Ritzy Bryan and Rhyddian Dafydd of The Joy Formidable. "The Greatest Light is the Greatest Shade"
"I Don't Want To See You Like This"
The Joy Formidable is rooted in a childhood friendship. This trio from Northern Wales started to grow when Ritzy Bryan (vocals, guitar) and Rhydian Dafydd (bass, vocals) began to work together in bands. As a duo, they honed their knack for pop hooks and textured backgrounds; drummer Matthew Thomas joined when Bryan and Dafydd moved to London. Thomas added some high-energy metal chops to The Joy Formidable's pop anthems. The band's official debut LP, The Big Roar, was produced in Los Angeles with Rich Costey (Muse, Foo Fighters, Glasvegas), and incorporated what the trio had learned from touring with Editors, Temper Trap and Passion Pit at venues large and small. Bryan describes the feeling of their on-the-road production as "the possibility of victory in a hopeless situation." Hear the band play live and discuss the North Wales music scene with World Cafe host David Dye.